The makers of Kim Kardashian: Hollywood and Kendall & Kylie are providing yet another opportunity to meet your favorite star and become a (virtual) celebrity yourself. 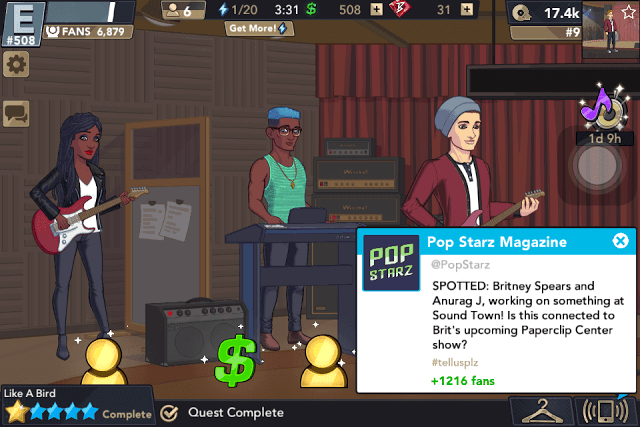 This time it is Britney Spears and she will help you become the next big pop star. You will need cold hard cash to purchase clothes and accessories for you and your musicians. You will also need money to travel from one location to another. Cash will be required to complete certain projects. Completing projects and performances is the best way to earn dollars, but tapping objects scattered all around a location can also get you bonus money. This cheat sheet provides a list of key locations and buildings where certain objects that drop cash when you tap them. Some objects like the Squirrel also drop extra energy. Squirrel under the tree. Patio umbrella just outside Starbeans. P signboard. Inside Microbe Music building: Bookrack. Inside La Estrella building: Guitar. Device next to Britney Spears’ mansion gate. Up arrow signboard (swipe left until you reach the end). Hot air balloon in the sky. Inside Britney Spears’ mansion: Puffer fish in the aquarium. Inside Sound Town: Big stereo speaker device. Inside Kihara: Portrait in the background. Flickering street lamp. Stall close to the “Navypier” signboard. Inside Navypier: Object in the background, next to the couple. “Flamingo” banner in the background. Big “Paris” banner in the background. Don’t just travel from one location to another just for tapping objects for money. Traveling costs cash and many times, you may have to pay more to travel to a different location. The money that you get from tapping objects is very less. Go to a location and tap on objects only when you have to complete a quest, performance or a project, date someone or hangout with your contacts. This way you can earn some extra bucks by tapping objects while completing them. Tap an object, collect rewards and then get inside a building to complete a project or performance. Exit the building and again tap the object to get rewards one more time. Invite those contacts that have a higher style score. Inviting them to your projects will get you bonus rewards. Make sure you buy them some clothes and accessories to increase their style score. You can also increase your style score by purchasing new clothes for your character. This will ultimately get you extra rewards on your projects and performances. When you perform or record a song, you will start with a style bonus and this will get you more rewards at the end of the project or performance. Venues where you can perform will usually have a blue music note on the door. Venues where you have record a song are usually marked by a microphone symbol. Purchasing clothes for you, your musicians and other contacts will definitely boost your style and you will get bonuses in your performances and projects. To meet new contacts, go to Microbe, String or Starbeans. Flirting with people you meet will be added as love interests, and you can later date them to get Inspiration. Once the Inspiration meter if full, you are ready to record a new single. You can also complete hangouts with contacts to fill your inspiration meter. Look for the hangout icons in certain locations to start a hangout. 1. Join labels and send friend requests to other pop stars on the “Members” section. Tap the 3 white dots and a new “Add Friend” window will be displayed on the screen. Press the add button to send a request. Your request will be sent to his/her message box and if they accept it, you are friends with them. 2. Login to Facebook and invite friends to play the game. When your Facebook buddies play this game, they will automatically be added as your friends. 3. Another way to add friends is to share your star ID via the in-game chat system. Tap the chat icon, which is just below the settings icon (gear). Under Global chat, enter your star ID in the message box above the chat box and press enter. 4. You can also add friends via the chat system. Look for three dots beside a chat member’s fan count. Tap it and a new window will be displayed on your screen. Tap the pink Add Friend button to add him/her as your friend. Do remember that whether you are adding friend via Star ID or through chat room, you can’t add them unless they accept your friend request. Completing projects, performances and quests will get you person icons and money. Keep collecting person icons to level-up. 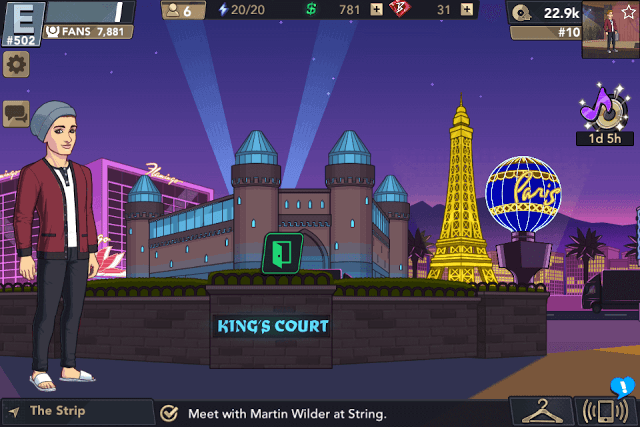 By leveling up, you will not only earn cold hard cash and Britney gems, but also increase the energy cap. For example: If your total energy cap is 16, then leveling up will increase it to 17. B-gems can be used for buying energy, expediting a task, rushing a phone etc. Try to save them for charming musicians, actors etc. so that they can be convinced and added to your contacts. Charmed musicians and contacts will get you more bonuses upon project/performance completion. Keep networking to make new connections, and don’t forget to add musicians to your contacts. When you are recording a single or performing live, look for musician icons around (example: a person icon with a guitar), tap those icons and select a famous musician from your contacts. Inviting popular musicians while recording a song will increase your song’s sales. To boost your sales, just select those musicians that have a decent fan following and a good style score. Musicians also gain fans. When a project is over, the musicians that you have added will get additional fans, and this will make them more famous. This in turn will increase your sales further when you add the same musicians to your performances or projects. Joining a label is one of the best ways to increase song sales. When you join a label, you have the opportunity to make friends with other pop stars. Don’t forget to like your friends’ newly created singles and they will return the favor. When you create a single, it is shared with every member of your record label at the Singles Feed. Press the “Like” button to like singles of each member of your record label on the “Singles Feed” and they will surely like your singles when it appears on their feed. Make sure you join a public record label. Joining a private record label will require a CEO of that label to accept you as a member first. Inviting famous contacts when performing live. Make sure they have a decent fan following. Adding more friends is also a great way to boost sales. Like your friends singles and chances of getting likes from them will be more. Buying new clothes for musicians in your contacts will increase their style score. Adding those musicians with higher style scores will also boost your song sales. Dating or hanging out with your musicians will also increase sales. Singles Feed not only shows new songs recorded by your friends and record label members, but also shows singles recorded by other pop stars as well. When you complete recording a new single, your song will immediately appear on your friends feed, label members’ feed and even those people who aren’t your friend or a member of your record label. However, chances of getting likes are more from your friends and record label members so don’t forget to like their singles to increase your chances of getting more likes. When people like your song, a message will be sent to your “Messages” box. Tap the mobile icon at the bottom right corner of the screen and tap “Messages” to see how many new likes your new song has received and how many sales you have earned. Complete and get 5 stars in your projects and performances before the timer runs out if you don’t want to lose fans. Getting one or two stars in a project won’t go too well with critics and they will post negative reviews about your performance. Ultimately, fans will be deducted from your total fan count. Do remember that you will have to increase your fan count to fill the Rank meter and reach a new Rank. All Screenshots, Courtesy Glu Mobile.